Mental Health First Aid (MHFA) England today announced that it will be moving its headquarters to the Tower Hill area of London. From 1 February 2019 MHFA England’s central team will be situated in the Royal College of Psychiatrists’ premises, in a self-contained office space that perfectly meets the needs of its growing organisation. 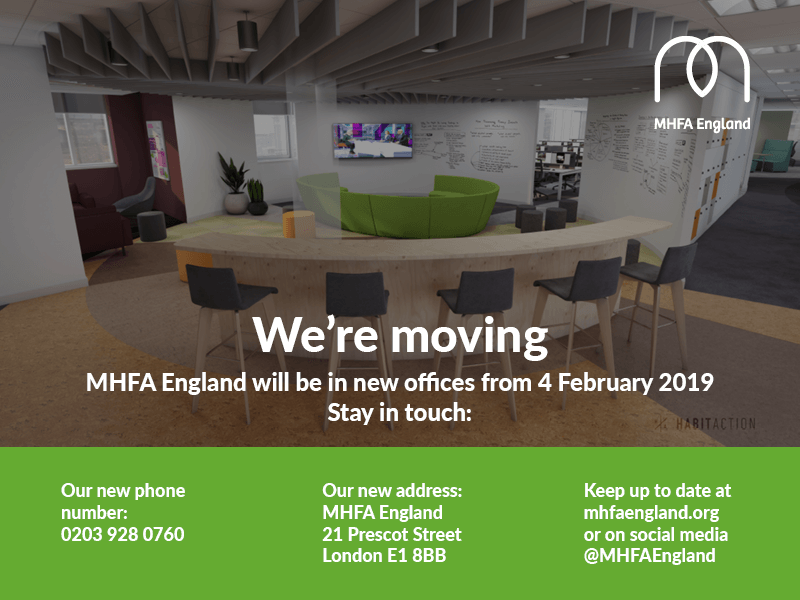 At the end of January 2019 MHFA England will leave its current offices in Old Street, which have housed the organisation since becoming a community interest company in 2009. Moving to the Royal College of Psychiatrists’ premises will provide MHFA England with a flexible working and meeting space, and will enable the central team to work even more effectively with partners, instructors and trainers. “We are extremely proud of our achievements over the last 10 years, which have included training over 1,800 Mental Health First Aid England instructors, who have delivered MHFA courses to over 330,000 people across England. We have grown significantly during this time and are delighted to have found an exciting new office space that meet our needs and will facilitate the next phase of our growth in order to help achieve our mission of training one in ten of the population in England in MHFA skills. “We welcome Mental Health First Aid England as our new neighbours and are delighted that they have found the right space to meet their growing needs.